It’s a new year and time to stick to those resolutions! 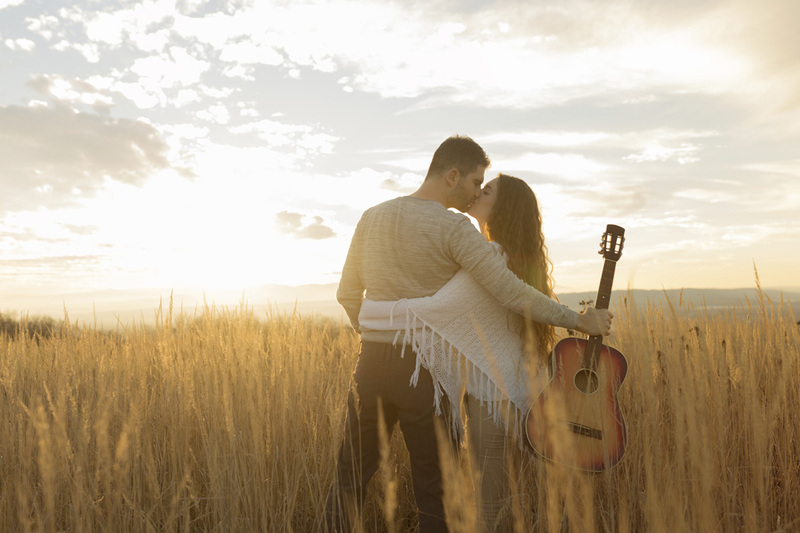 If you’re a bride, among your resolutions could be finding the perfect gown, planning regular date nights, or getting in shape for the wedding. Or maybe you’d like to start a business, volunteer in the community, or take on a new project at home. Whatever your goals, we’re here to help. We’ve collected ten tips for ways to stay motivated and make your dreams happen in 2017! Framing a SMART goal is one of the best ways to get started. Though the letters can mean different things for group or personal goals, here’s a review: S is for specific, M for measurable, A for attainable, R for relevant, and T for time-based. Identify your passions and be realistic. If something isn’t that important to you, you probably won’t follow through. Make sure you want this and it’ll make a difference in your life. If you enjoy the journey, it will be easier to remain focused until you reach the destination. Many people fail to reach their goals because, psychologically, it’s really difficult and scary to do something big. But if you break it down into smaller tasks, suddenly your goal seems much more achievable. Figure out the steps you will take, and determine a reasonable timeline. Could be a reason you haven’t achieved this goal yet is that you may be lacking some of the skills or knowledge you need. Fill in the blanks. Ask people in the field for advice or research it online, and figure out how to do what you’re doing. Get the tools you need to begin. Negative self-talk is damaging. How can you do well if someone (you) is putting you down all the time? You might think, It’s not that special. Other people have achieved greater. FYI, this is your goal, so compare yourself to you. If you’ve done better than yesterday, that is worth a positive response. 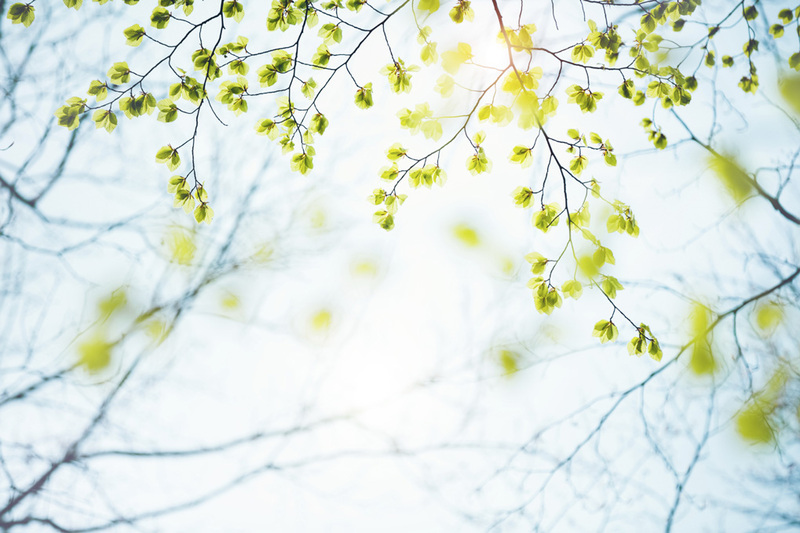 When something new becomes part of your daily life, change happens. Since you won’t always feel motivated, commit to a routine. It won’t be easy. You’ll run into excuses; with clever planning, you can figure out how to get around them. Own responsibility for your actions. Where does determination come from? When you focus on a goal, there is a driving reason behind it. Brainstorm all the positive reasons that you’re doing this—keep asking why until you discover your ultimate purpose. Draw strength from the deep meaning in what you’re doing. Whenever you need a boost, reward yourself! Even if an achievement is small, it’s still progress. 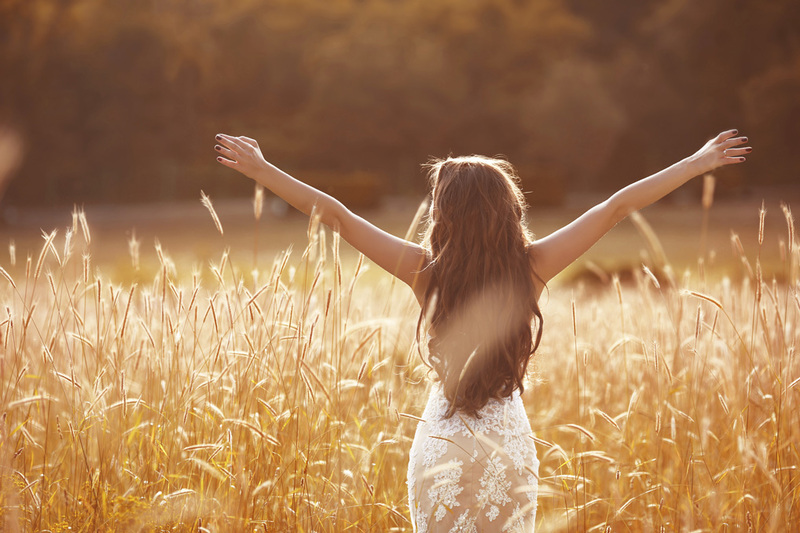 Congratulate yourself in meaningful, enjoyable ways that won’t conflict with your goal. Also, let other people know when you’ve achieved a milestone. A pat on the back is well-deserved support. You may get stuck along the way, or even have trouble starting. Ignite your drive by visualizing success. What would your life be like if you were successful? Find pictures online and write in the details of what you particularly want. Find a mentor or example of the success you seek for inspiration. From outside circumstances to depleted enthusiasm, various challenges may force you to a grinding halt. At these times, be flexible. Give yourself permission to change, but don’t abandon your goal. Identify specific roadblocks and find solutions. Evaluate progress and re-plot your course. Winter weddings are gorgeous. Not only do you get pristine snowy scenery, but anything that sparkles seems even more brilliant. 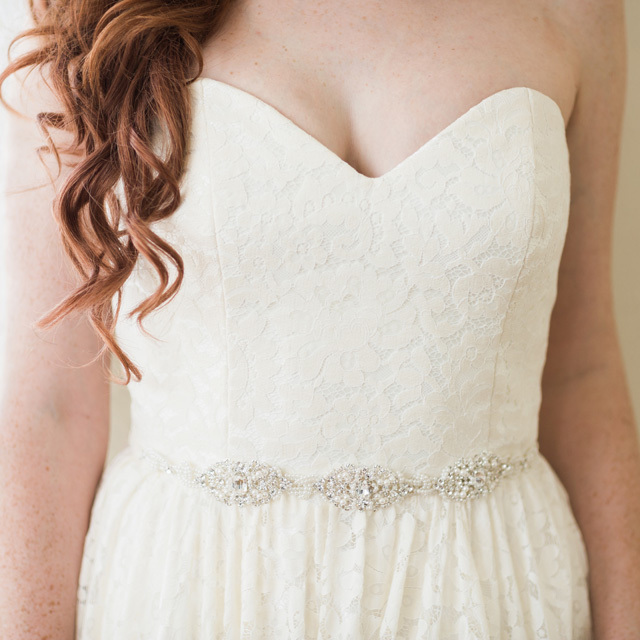 We love bridal belts because they tie your other accessories together so well. They also “dress up” your gown with some extra shimmer. That’s not to mention that they’re super figure-flattering, too! These stylish accents are so perfect for glamorous winter weddings. 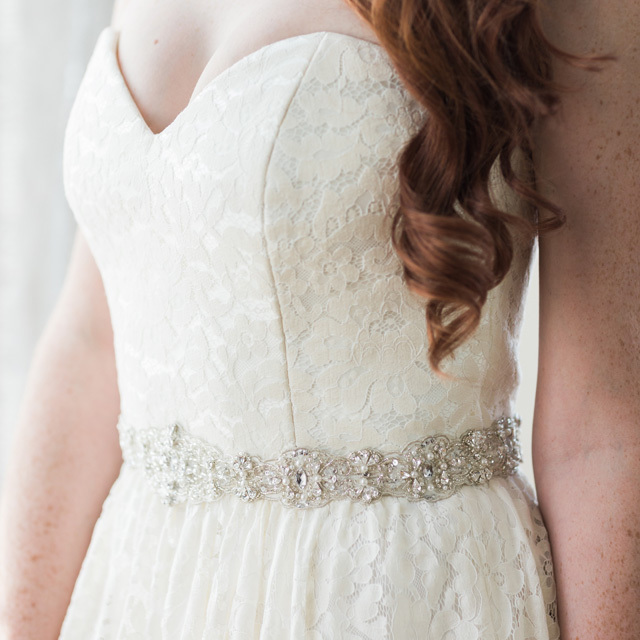 Our pretty bridal belts feature glittering rhinestones, intricate beading, and budding flowers. Transform your gown with a romantic, eye-catching accent and make your outfit uniquely beautiful—just like you! A soft tulle sash blends into the background of your gown, while the stunning silver filigree design twists and twirls with gorgeous sparkle. 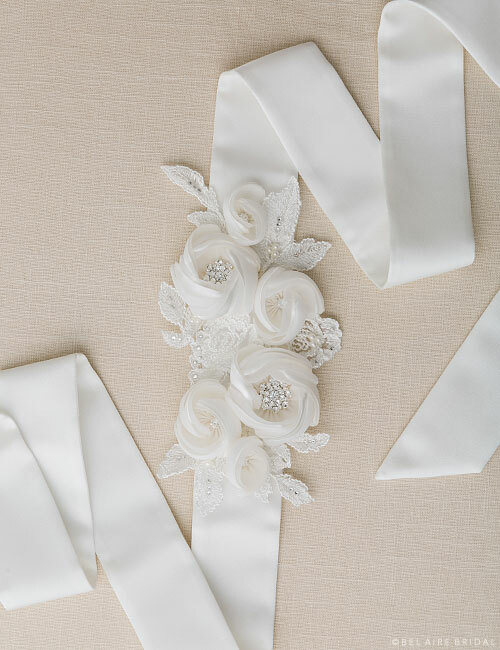 This lovely tie belt can come with ivory, white, diamond white, blush, champagne, or latte tulle. Pair it with drop earrings or a shimmering veil for a glamorous look. Retro and utterly fabulous, this sparkly little number features a vintage-inspired design of silver beading and shimmering rhinestones. Pair this captivating piece with Art Deco earrings or a faux fur wrap to accentuate your theme. Style your look with a bold red lip and some sass, while you’re at it! 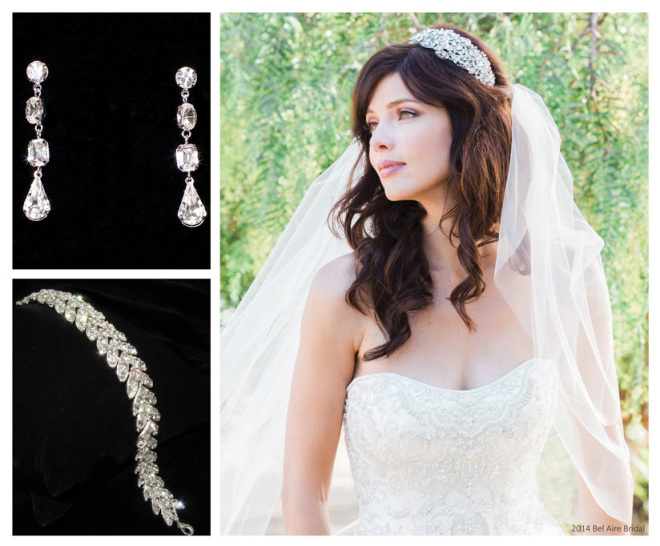 There’s nothing like pure sparkle to complement a dreamy bridal look. Tie off a noteworthy ensemble with a pretty belt featuring clear or opal rhinestones in a shimmering line. This simply gorgeous design matches a variety of other rhinestone accessories and easily ties on ribbons. 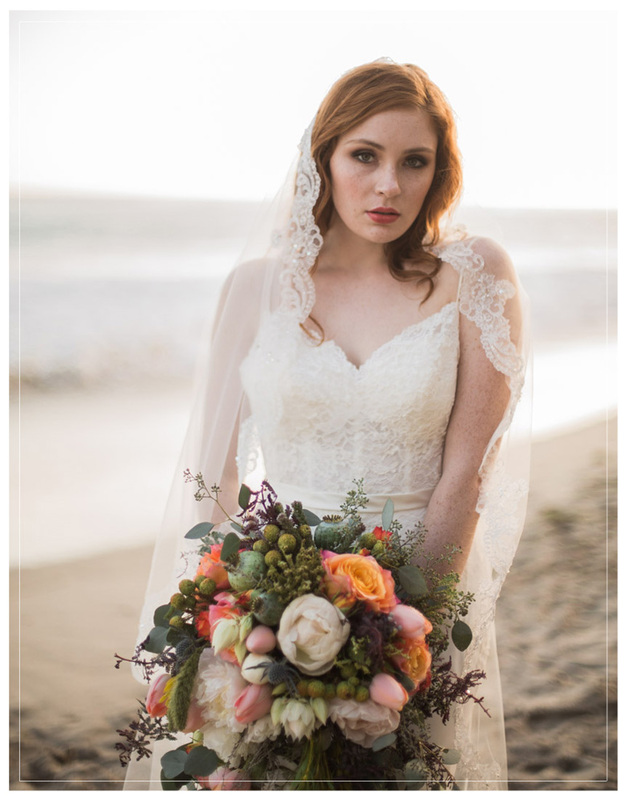 Thinks flowers are just for spring and summer weddings? Not so fast! This lovely peony tie sash features sparkling rhinestone accents and beaded lace for a classic accent that looks romantic in any weather. 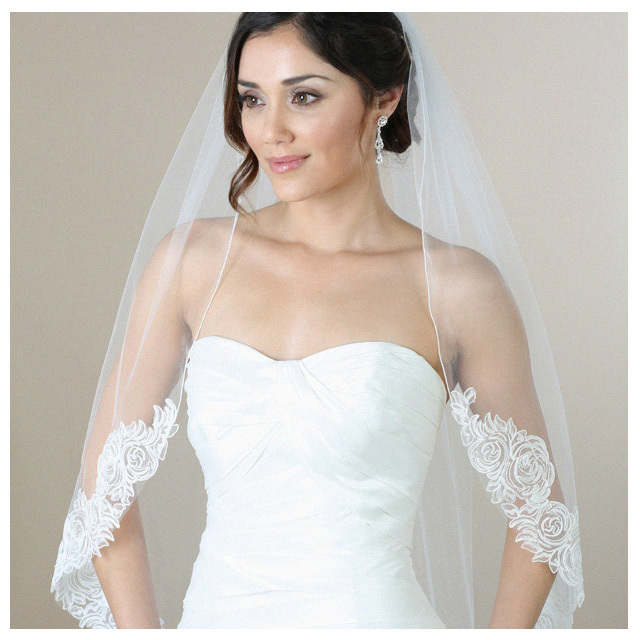 Tie it into your ensemble with a lace veil or floral accents in a neutral color scheme. Styling a fairy-tale ensemble? Exquisitely regal, this rhinestone-embellished tie sash lays on the sparkle; detailed, silver beadwork creates an opulent accent fit for a princess. Pair this with the rhinestone accessories of your choice for an unforgettable outfit. Want to see more? Browse our Belts page to check out a variety of designs. Be sure to pick out Jewelry to finish off your look! Are you in love with lace? We sure are! Lace is a timeless fabric that evokes feminine grace, charm, and beauty. Gorgeous floral designs are still expressed in the intricate laces we use for bridal accessories today—from delicate Chantilly to formal Venise to elaborate Alençon patterns. 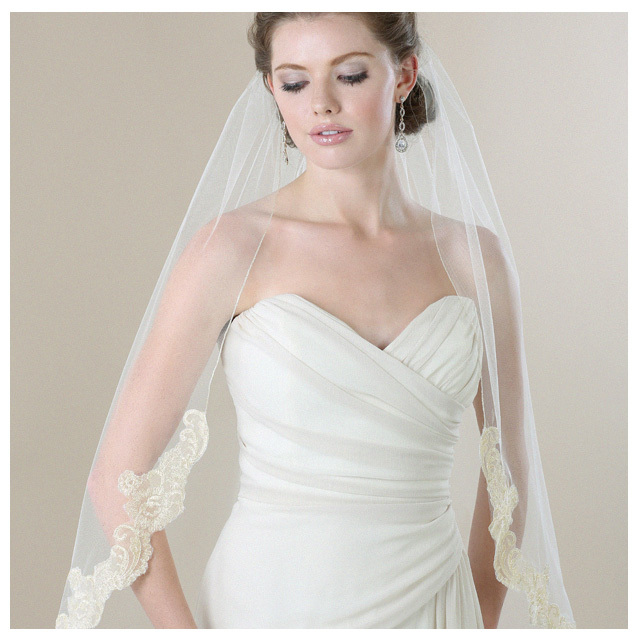 Whether softly ethereal or regally elegant, lace infuses an air of sweet romance into your wedding ensemble. 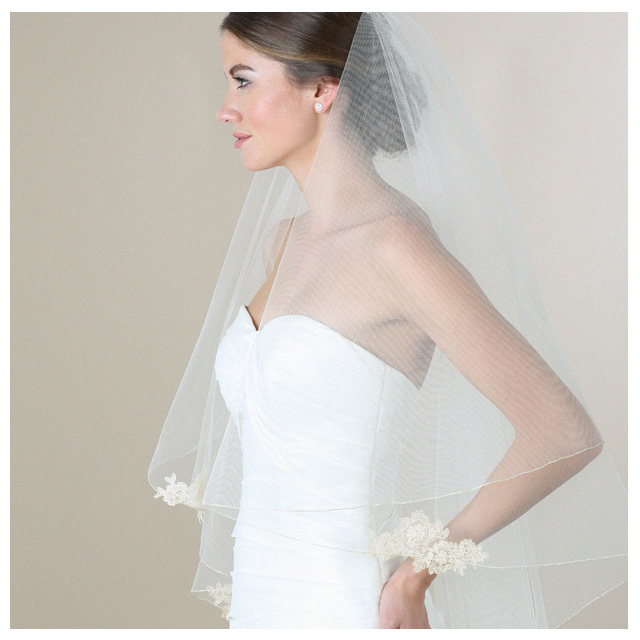 Today, we’re highlighting lace veils from our newest collections. If you’ve chosen a lace gown or wish to enhance your bridal look with pure amour, keep scrolling and discover the perfect style for you! There’s something so casually pretty about style V7280. Intricately stitched with a bold pattern of roses in full bloom, this unique design blends traditional bridal motifs with modern, innovative style. A simple rolled edge leaves room for other accessories. If you’re wearing a minimalistic gown or carrying roses, this style harmonizes beautifully with your theme. Gracefully cascading down your shoulders, style V7281 features a delicate metallic rolled edge and pretty lace appliqués. Beautifully designed with gold or silver accents, this dreamy veil is made for the romantic bride seeking just a touch of metallic shimmer. Pair this piece with a bridal halo, hair jewelry, or shoulder jewelry to make your appearance even more stunning. 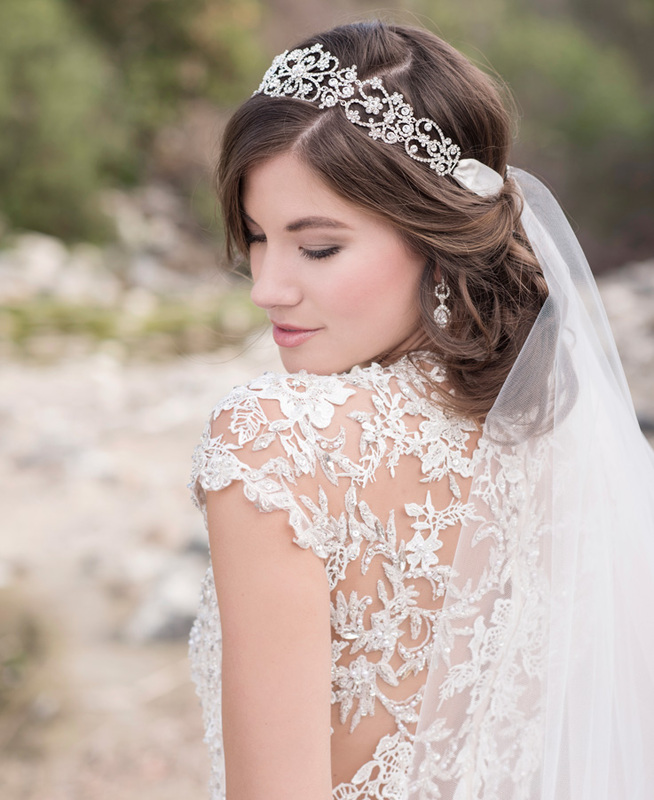 Formally bridal and regally beautiful, a narrow trim of Venise lace completes your look with true elegance. Light beading adds subtle sparkle, giving style V7273 just a hint of glamour. If you’re wearing lace accessories or a fit and flare lace gown, this lovely design is made for you. Metallic tones are a great choice for autumn weddings. If you want to shine in silver or gold, style V7270 combines beautiful lace with metallic embroidery. Intricately gorgeous and elegantly romantic, this pretty design pairs perfectly with your gold or silver accessories. Create a dreamy ensemble that is entirely you. Want to see more lovely lace styles? 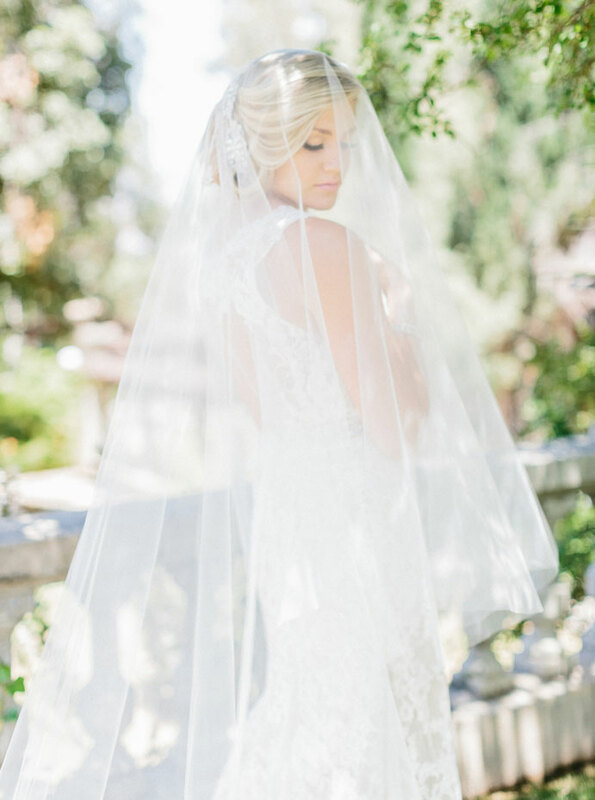 Check out our lace veils and cathedral veils to find the perfect design for your wedding. Try them on in a store near you, and let us know which one is The One! 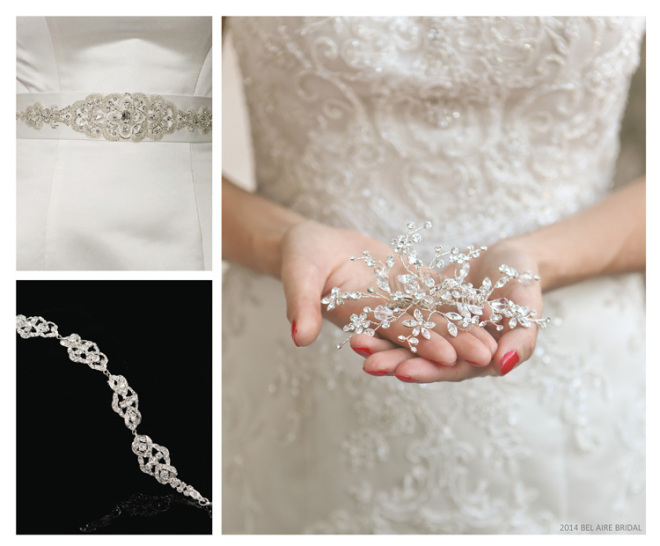 We love the versatility and beauty of bridal belts. 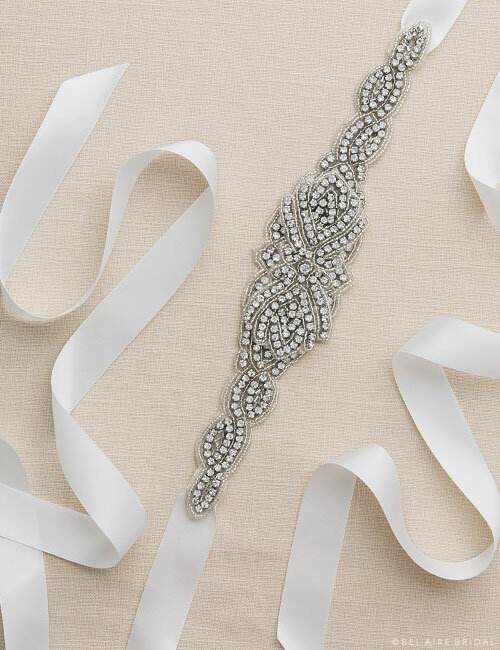 Available in a variety of shapes and colors with gorgeously constructed beading and sparkling rhinestones, a bridal belt adds unique beauty to your wedding day ensemble. Here are our top five reasons you should wear one. Okay, so you scouted Pinterest, Google images, your favorite bridal magazines, and a plethora of blogs for the perfect gown… but you do realize that hundreds of other brides will be wearing the exact same one? Make your wedding feel extra special and give the dress your own personality by adding a belt. 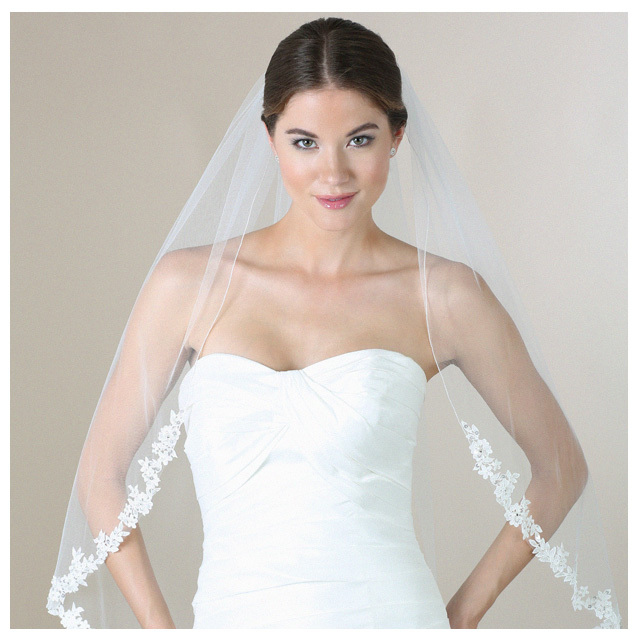 This transforms your bridal look with a new style that is completely your own. Some gowns are almost perfect… but could use a little bit of help. Maybe the dress feels snug in one spot, but needs to be taken in or let out in other places—which makes sense, as no two brides will be exactly the same fit! One way to make a gown flatter your silhouette is by wearing a belt, which adds a point of reference for the eye and gives your waist slimming definition. 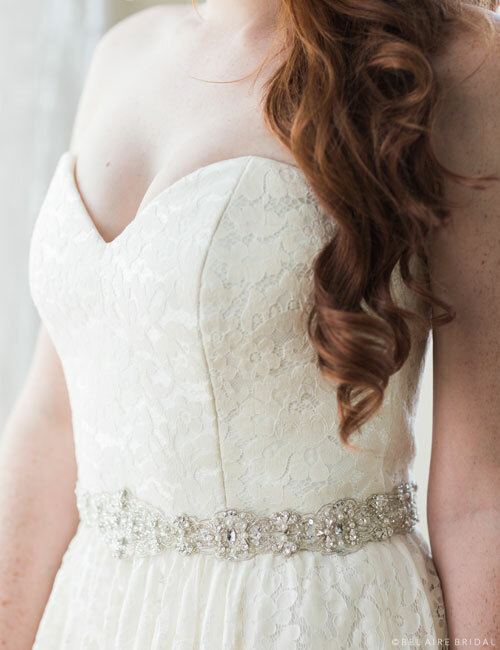 If you have a simple gown or find yourself getting lost in lace, a bit of sparkle can help! Many belts feature intricate beading or pretty shimmer that helps to glam up your look. Belts can also beautifully complement the details on your dress or match a lovely headpiece. A dramatic sash can add a pop of color to your entire ensemble. A romantic bow back dresses up your pics with even more bridal beauty. This look is feminine, retro, and totally chic. 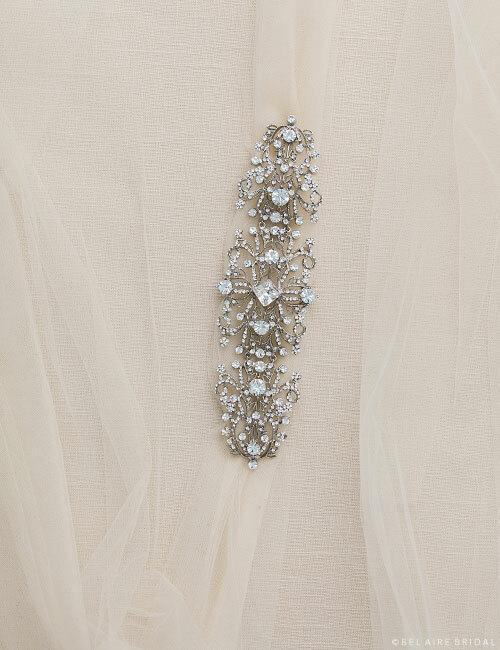 If you’re wearing a dramatic veil, headpiece, or shoes, consider adding a belt to complete your wedding wardrobe. A pretty belt draws the eye and will help tie together your other accessories for a coordinated, balanced look. Check out our Belts page to see all the looks available. Visit our Store Locator page to find them in a bridal salon near you! 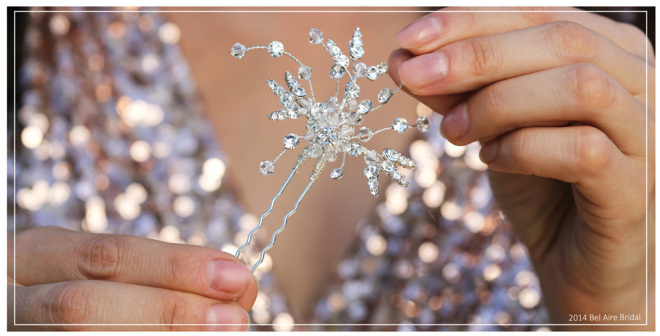 Looking for breathtaking accessories for your wedding? Check out this week’s Perfect Pair: styles 6518 and V7198. 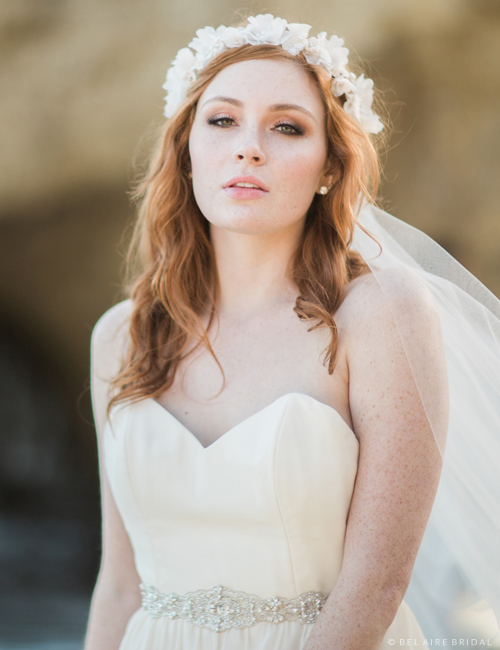 This headpiece and veil wonderfully flatter an elegant, formal bridal ensemble. Style 6518 features sumptuous swirls of rhinestones glittering on a satin tie headband. Paired with V7198, a simple rolled edge cascading knee length veil, you’ll absolutely captivate your groom. Strike a winning balance of glamour and romance with this eye-catching combo. You can complement a pretty lace dress or sparkling sequin reception gown with these gorgeous accent pieces. The simplicity of V7198 contrasts beautifully with elaborate trims or lace details; stunningly sparkly 6518 mirrors the posh beauty of a heart-fluttering gown. 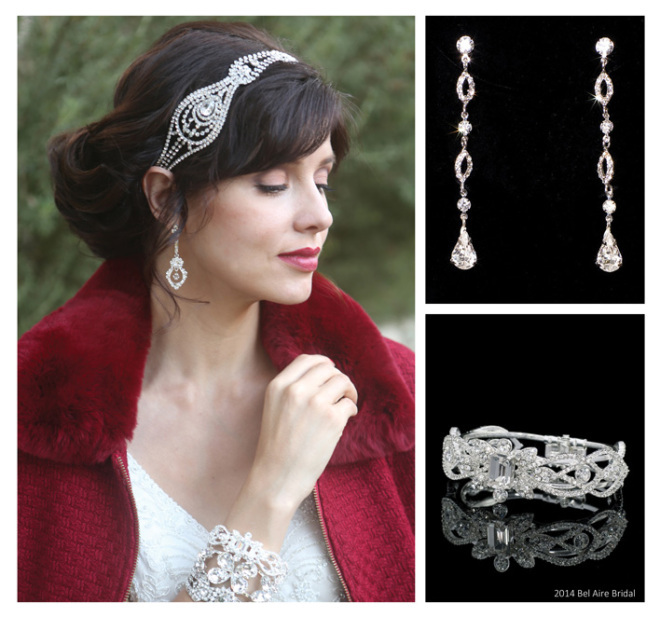 Just add earrings for an utterly enchanting ensemble! How would you wear this pair? Tell us your favorite gown match! Need some inspiration for styling your New Year’s Eve look? Read on for tips on how to add bling to every party ensemble. Celebrate the New Year in true style! A long, sparkling gown paired with a sumptuous headpiece and dazzling earrings will make his heart skip a beat. Our 6351 fascinator captures the light with extravagant rhinestones arrayed in a lavish design. Matched with a stunning rhinestone bracelet and gorgeous dangling drop earrings, you’ll turn heads. Tip: Coordinate with your guy. Make sure he looks snazzy and will complement your gorgeous bling with a sharp suit or tux! Have you had a fabulous year? Celebrate the decadence of ages past and open yourself to a wealth of new experiences with a dazzling vintage theme! Our 6501 rhinestone headpiece and rhinestone encrusted BC123 bracelet add the perfect touch of bling. Add simply stunning earrings to finish off the ensemble—after all, you’ve got to look stunning. You’re the life of the party! Tip: Add a pop of color with a racy red lip. Ring in the New Year with a snazzy dose of flirtatious fun! Bling up a little black dress with irresistible sparkle using our 6522 crystal headpiece, beaded and rhinestone belt BT010, and shimmering bracelet BC108. You’ll shine long after the fireworks go out in this dazzling attire. Tip: Stack bracelets for more bling! We wish you all a wonderful New Year! 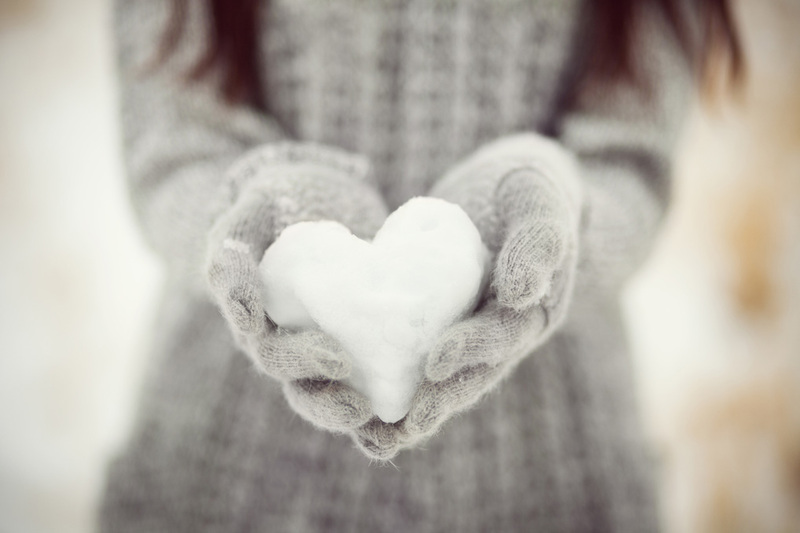 ♥ How will you make 2015 your best year yet?